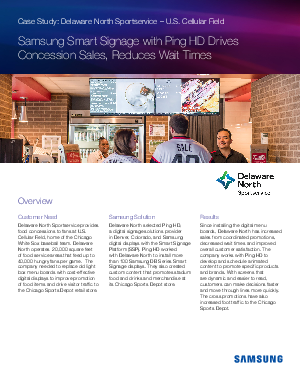 Delaware North selected Ping HD, a digital signage solutions provider in Denver, Colorado, and Samsung digital displays with the Smart Signage Platform (SSP). Ping HD worked with Delaware North to install more than 100 Samsung DB Series Smart Signage displays. They also created custom content that promotes stadium food and drinks and merchandise at its Chicago Sports Depot store.